Scarves in the Round author, Heather Walpole, came to visit the Yarn Thing podcast with Marly Bird today. Heather Walpole is a first-time guest, so we have lots to learn! Heather blames her sister, who owned a yarn store, and got her to crochet. She still has that swatch, which got tighter the more she worked on it. Later she taught Heather to knit, and the colors began to fascinate her. Heather went with her to attend TNNA and, with her background as a graphic designer, one day she got the idea to start her own line of yarns. This was the beginning of Ewe Ewe Yarns! She began with offering 7 colors of worsted weight yarn. Heather finds worsted is most comfortable for her to knit, and designing with it, her best. Starting out, she ordered the minimum number of colors, and a couple of great yarn stores right from the beginning have carried her entire line. Wooly Worsted is now (after only three years!) available in 20 colors and she has another line, Ewe So Sporty. Click here to find a store near you, or where you can order online. Hope you’ll tell them you heard it on Yarn Thing! Heather has great pattern support, herself. You can see from her Ravelry Designer profile that her take on knitting is wide and varied. You can also find her pattern lists at her website, grouped by topics, such as Babies & Kids or Hats & Mitts. One day she was standing in line at the Post Office checking her phone, and she received an e-mail from Stackpole Books. They actually suggested a book of scarves in the round, Heather liked accessories so the fit felt good. They suggested 25 patterns, Heather divided it into sections, Basics, Lace, Textures and Colorwork. The yarns she’s chosen were based on it being the best the project could look, aside from her own from Ewe Ewe. She took a few friends and they modeled (herself included) in her little California beach town, which gave her the ability to portray the scarves the way she wanted them to appear. Heather Walpole can be found at her website, her designer page Ravelry (and there is a group for fans of Ewe Ewe!) The book can be purchased at Amazon, so go and put it on your wishlist, like I did, at least! 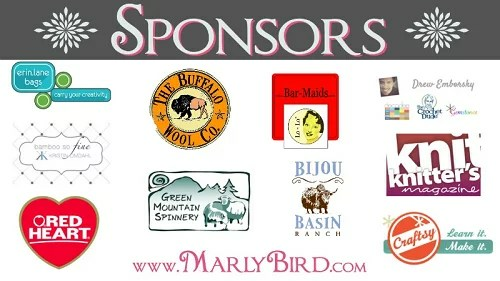 Marly says she’s off to a local yarn store, Find Your Stash in Castle Rock, Colorado, to check out the Ewe Ewe Yarns there! 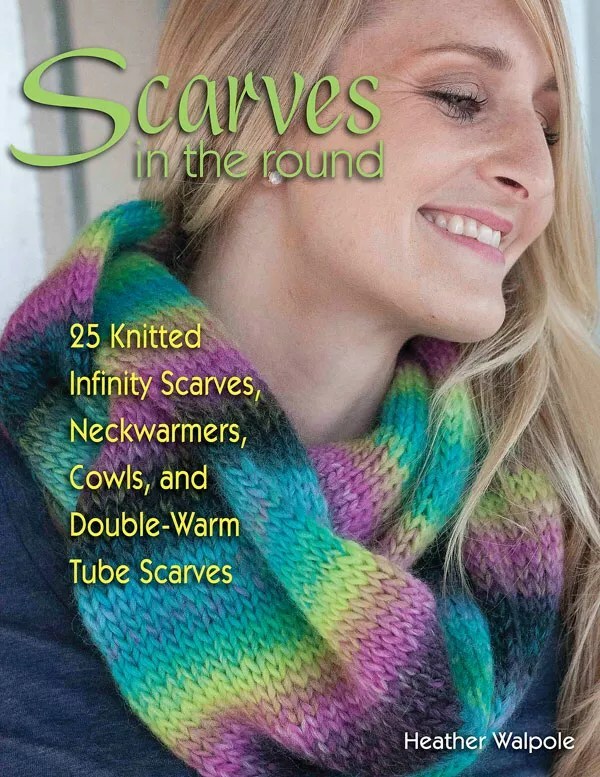 If you missed getting to listen LIVE, you may hear it as an archived episode at: http://www.blogtalkradio.com/yarnthing/2015/06/18/scarves-in-the-round-author-heather-walpole or in iTunes. I really enjoyed listening to Marly and Heather today. Great podcast! Great podcast again. I would love to try ewe ewe. I will put it on my wish list! I found Ewe Ewe yarn at a “local” yarn store. When I need a long drive (2 hours away) and fantastic yarn experience, I head to The Tinsmith’s Wife for a fix. They stock Ewe Ewe! I’ll get to pick it up and squish it in person when I go visit next time. I really enjoyed the podcast!! I would love to try Ewe Ewe yarns. And the book sound so interesting. As I new knitter it sounds like there are a number of projects I would like to try. The podcast cut out just as the “word” was said so I don’t know what it is. Enjoyed the show anyway. Loved the podcast! Now I have to try some squishy ewe ewe yarn. The only problem will be deciding which color(s)! Ewe Ewe yarn is on my wish list! Great podcast! Really enjoyed today’s podcast. The Ewe Ewe yarn looks so nice. I didn’t realize a LYS in my area carries it. I will have to go there to check it out. Loved the podcast today and hearing all about Ewe Ewe! It looks beautiful! What aa great show. Looking forward to checking out the yarn and the book…no keyword? My most favorite yarn shop closed recently, the owner retired. So, I will need to find a new LYS to explore Ewe Ewe. Thanks for another great podcast. BIG FUN! Loved hearing about Ewe Ewe yarns and how much goes into a new yarn line. Thanks for sharing more about the book, scarfs in the round. It was so interesting to hear what goes into creating a yarn line like ewe ewe. Another great podcast, loved hearing about the development of Ewe Ewe Yarns! Very interesting hearing about Heather’s start in the yarn business! I’ll check on her Ewe Ewe yarns and see if I can find them here! Thank you, Marly! Loved hearing about how Ewe Ewe came to the marketplace. Now I have another yarn I want to try. Thank you, Marly, for another interesting show. I was looking forward to hearing heather. I just did the baby knit along sweater with ewe ewe. I loved the knit along, Heather did a great job answering all my questions over instagram and it was a pleasure listening to the podcast. I listened here while on the bus. Loved it! I’d never heard of Ewe Ewe yarns before- will definitely check Heather out! This is a yarn that I haven’t hear of before. Ewe Ewe yarn sounds like a joy to knit with and I would love to try it sometime. Thanks for a great podcast. Ewe Ewe Yarns are on my “to try out” list – a store not far away carries them! I would love to try Ewe Ewe! I’ve already looked up to see if my LYS has it and they DO! I’m so excited! Loved the story about creating ewe ewe yarns and developing the book! Good luck on future expansions of the brand! It was interesting to learn the history behind the creation of Ewe Ewe yarns. I hope to locate some soon at an LYS . LOVED hearing about how someone starts a yarn company. I can’t wait to try some Ewe Ewe yarn. My morning walk was very enjoyable listening to Ewe Ewe! I never had heard of your book or your line of yarn. Got to check things out! Thanks!! I have to go go.! I hope Ewe Ewe has a prize for Me Me! After listening to the podcast, I am so anxious to try the yarn. I love knitting scarves and cowls. The book is calling me.